One the most dependable yet stylish projectors to ever amaze you with high quality picture, Epson steps up to the pate and delivers on its promise. You will truly love the way this projectors can light up a room in seconds with great contrast of colors and millions of pixels to use for creating the best picture to complement your sound quality. One thing that stands out to me is the Wide screen feature which makes a 60-inch TV look so bland. We are talking about 4x times larger than your normal average flat screen here. I love the 60,000 to 1 ratio High definition contrast, you could actually see the difference in changing images. If you’re having trouble watch images in darker scenes, Take a look at this model, and see the comparison. 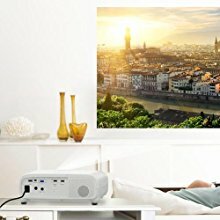 Many people don’t really know what’s so great about this projector until they see for them selves how much color brightness display across your screen until you play one of your favorite movies. Good question to ask, It’s three times the illumination for the elimination of the rainbow effect that most flat screens produce. It’s wonderful to watch a good flick and see no type of different rainbows and ruining your movie performance. Trust me this is a game changer for real. Imagine watching a fast-paced action flick and see nothing but a full display of rainbows while the movie gets to the best part, that is enough to make anyone cringe and quint at the screen. Can I stream Games and Movies On this Epson Projector ? Absolutely, It’s not only possible, Epson enhances the experience which HD quality to make it even more Fun to enjoy. This is all possible to connect with your favorite devices that has a (MHL) mobile device high definition link, which uses two ports for connections. Gaming is about to get a lot better due to the excelerated high definition Epson 2150 brings to make you think the console it’s self is upgraded automatically. Stream your favorite sitcoms and stream them like a pro using your mobile phone or tablet to set up the stream and relax. Looking to display pictures of love ones to show off the family? no problem, Epson uses a feature called, mirroring which could take your favorite digital photos and display them over a larger screen for everyone to see. Just hook up the devices that is MHL enabled to the Epson 2150 and watch the memories display across your wall or projector screen. Wherever you feel is a good place to put it. Thanks to this new technology, The Epson 2150 projectors can be placed in many places around the room with a feature called Flexible Positioning it’s really an easy setup to have it where you need it most. The vertical lens shift and 1.6x zoom will allow the projector to auto adjust positioning for better suited areas. So Imagine your living room with this Epson 2150, and look around the room to find a favorite positioning spot to watch movies or play video games. Now imagine the look on your family face as the colors and brightness fills the room. See the difference of amazement and joyful experience and fun filled energy around each other as they witness the new way to interact with this new Epson projector changing the family living room lifestyle. This Is What It’s like to have a home theater lifestyle, It about enjoying each others’ company, It’s bringing your loved one together to spend time with one another. 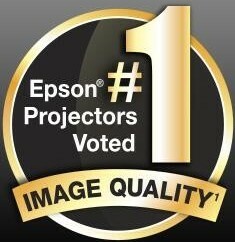 Oh It’s true, Buying an Epson 2150 projectors will save you money and time. I have found a way to for you to save HUNDREDS of dollars on this particular projector. Everyone love to find a good deal when it comes to shopping. Look, no one likes to spend hours and HOURS trying to get the right projector for their home, so wouldn’t it make sense to avoid both by checking out a great offer to save you from the hassle and meets what you were going to buy anyway? projector Keep reading for more information and good tips and advice. Let’s do a quick recap on what we found on this projector. Widescreen Projection and the power to 1080p and has the 4 times larger than your normal 60-inch TV. Lumens 2500 of brightness and Balance set of colors and Bright whites. Built in 10 inch watt speakers for easy setup and good backup sound. What Is The Epson 2150 Specifications? It’s good to know about this in general to help with shipping, installation, troubleshooting potential problems and good tips to follow for good performance. Also, where going to offer the pro’s and con’s to find out where or not your this model can fit your needs for entertainment. 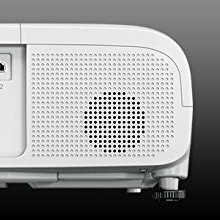 Pro’s: Epson 2150 is one of the TOP selling projectors with an Amazon Choice award for high quality, top rated customer satisfaction. The Vertical shift feature is a game changer because it’s easy to move the projector lens up or down if your in different positions. if you’re having trouble with screen adjustment with other projectors in the past, have no fear because this projector has a feature called “auto Keystone” which automatically centers the screen to the right position for you, but also has a manual option for personal centering. Con’s: I’am disappointed that the AA batteries do not come with this model, there’s nothing like opening up the box to a new toy to find out the batteries are not included. This projector does not support 4k technology which is a bit of a bummer because it’s makes the experience that much better. It’s recommended to buy a good projector screen to help optimize the high quality performance you need out of the Epson 2150. Although you could paint the wall and save an extra 1000 bucks, but there is a trial and error process that is just not worth the hassle. I would suggest looking into this recommend projector screen for the Epson 2150. This will give you all the fine qualities of this projector you have been looking for, plus the quality for gaming and mirror flexibility is second to none for better quality. It’s clear to me that in order to have the best in entertainment when it comes to HD picture with great colors effects and flexible positioning to follow which has more than enough widescreen projection at 4x the screening than a 60-inch screen TV. You have to try out this projector not only for yourself but for your family as well. Be sure to check out the Epson 2150 projectors It’s definitely worth the investment for your home theater lifestyle. Please be sure to leave a comment sharing your experience and ideas with us. Your valuable opinion is important to us.